You look to a website that was anonymously registered a month after Ruja Ignatova disappeared to "look at the facts first"? Then again, they do devote an entire page to recommending investment in the Crypto World Evolution SCAM. Perhaps they are the kind of website operators that deliver "facts" that are music to your ears. atozcrypto.org is very far from facts. It fakes and falsifies articles to make them pro-onecoin. Igorkrnic wrote: ↑ I would ask people not to follow this website or to spread its unofficial fake news cause it is only doing damage. Please do not spread or double check "news" from satendrasaini.com and atozcrypto.org. The company does not have anything to do with any of those websites so those are orchestrated either by questionable members or haters in disguise trying to make this kind of damage to the company. Constantine was arrested in the United States, where will Onecoin go? The following analysis, we need to consult to see the current problem. Some US rivals are not unaware of the Onecoin survey in Europe, not unaware of the results of the investigation, but in fact, without these conclusions, they know what the essence of Onecoin / Dealshaker is. But when Onecoin is active in Europe, Asia or Australia, it does not affect them in the United States, but when Onecoin intends to enter the United States, the problem is different, so some Onecoins enemies still make false accusations. These foxes have been rejected by a court and now it is not repeated in the United States that it should produce results and we do not need to be too worried. 1. The company's legal department quickly rejects the claims, no evidence or arguments. There is no firm reason and the court will suspend the investigation with the same conclusion that Onecoin was found to be non-offensive and legal in the United States. This is the best and most likely case, and when Onecoin / Dealshaker enters the US very smoothly and has strong development opportunities. 2. If, for some reason, the court does not accuse Onecoin, but still finds ways to prevent the company from entering the United States, this will delay the company's progress and lead to a legal battle. Long-term because the US also participates in international organizations and does not easily create its own barriers. 4. With regard to the company's ability to win, it is very high because the US court must also consider some of the conclusions of the courts in European countries. Many problems can only be concluded with or without clarity, such as money laundering? Does Onecoin have a blockchain? May prove very simple that no one can argue. 5. The worst case for the US company is that it definitely prevents Onecoin / Dealshaker unreasonably in the US, the company has almost the world or, in other words, the world, except America. This also makes the Americans so it can't be long and even Americans will fight for lawful right on Onecoin. 6. Another thing is if the United States accepts Onecoin, when it goes on the floor, trading online like Bitcoin today, so it's not easy. But if we believe the government will cooperate, the government will get tax, but what is the ban? I don't want to shout the slogan: Be absolutely confident in the company and want ACE to have confidence in its knowledge, analysis and understanding. Hope everyone will exchange more. Well that is all wonderful. SO epic-7 what is your take on the fact that criminal charges has bin filed against ruja and konstatin ? Most onecoin supporters seem to agree that its just a minor setback and at worst it will delay the exchange a few weeks? months? years? decades? Unfortunately for Onecoin, the repurcussions of the US investigations will be very serious for it's business and financial future. No regulated bank anywhere in the world is going to open or operate any bank accounts related to Onecoin while the investigation is ongoing. So how are they going to operate an exchange, or go public? And even if Konstantin is released (the odds are very slim), there is Sebastian Greenward and Mark Scott to be dealt with. Ruja's indictment being made public complicates things even further. She is obviously hiding in a country that has no extradition treaty with the USA, probably somewhere in the UAE, but that indictment, now freely available to any compliance officer in the world, will stay with her for life unless she offers herself up for trial in the USA, and is then found innocent. I know it is not the same but Volkswagen CEO was arrested for CO2 scam and VW will not die, mainly because of the user base that still wants to buy cars and company that will still work. Now I know all of you assume (just like DOJ does) that Ruja and Konstantin orchestrated all those money launderings. What if they didn't? 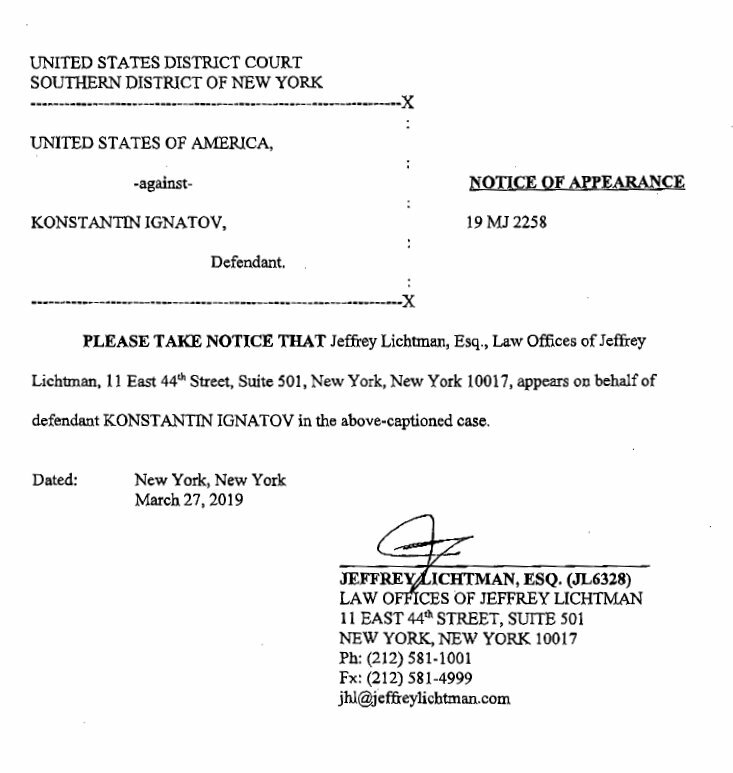 Let's stop speculations please and wait for the hearing to see what Konstantin will have to say in his defense or maybe what evidence will he present. In the meanwhile, the exchange is building as expected, deashaker continues to develop, those are separate companies and they will not be affiliated with Onecoin in case any bank would blacklist Onecoin and they did since 2017. But I hope that will calm down if they prove themselves. Example, make blockchain accessible to the public. The first wave of OFCs are being delivered to those who got them by exchanging ONE in 2017. The company works as usual. And will continue to work no matter the outcome for Ignatovs. It will die if there will be no one to lead the company and users quit, of course. But I don't think anyone will ban or seal ONE future just because of this since I see no ban for VW cars after arresting their CEO. I will lock the topic until we have news about hearing. P.S. I personally advise all people to stop promoting Onecoin and use it's logo anywhere until USA investigation is over. Onelife IMAs are suggested to hold on planning new events and to certainly not use Onecoin material and promote it. (the irony is they should follow this rule since 2016 but their ignorance and greed did its job and we are where we are today). Awaiting hearing material to contnue discussion.